I confess I had misgivings about reading Wm. 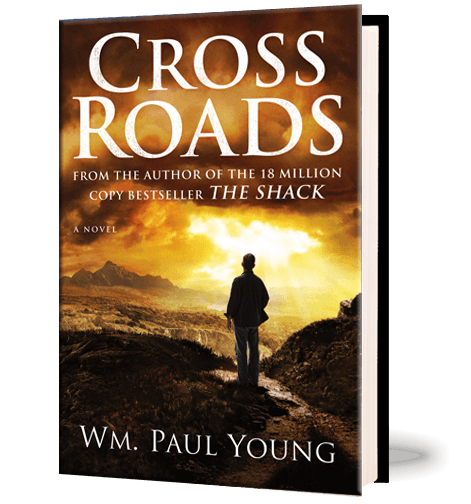 Paul Young’s Cross Roads this week. I avoided his best-seller, The Shack, when everyone in my congregation was reading it and my wife was telling me how good it was. But she’s used to my capricious, intellectual aversion to popular books, so she didn’t press it. I’m happy to say that Cross Roads is definitely a good read, both intellectually and emotionally. Cross Roads is a redemption novel, the surreal spiritual pilgrimage of protagonist Anthony Spencer. If you’ve read The Shack, then the fact that Tony meets both Jesus and the Holy Spirit in the flesh won’t surprise you, and neither will the Zen Master tone of certain portions of the book. If you are able to suspend disbelief and accept the fictional universe Young has created, then there’s a lot here for you. I was very interested in the number of literary models Young used in Cross Roads. Hopefully I’m not spoiling anything to say that chapters move from Socratic dialogue to Pilgrim’s Progress, from episodes of Mission Impossible, Sliders, and House to movies like Ghost, Always, and Dogma. Some of this bothered me until I realized that Charles Dickens’ A Christmas Carol has been rendered scores of times in different mediums. In the cases of Ghost and Mission Impossible Young gives an explicit nod to the sources. Aside from these comments about style and models, there is that redemption story I mentioned. Tony Spencer begins the story as a financially successful, distilled monster suffering some serious psychiatric issues, and is redeemed. I’m a reasonably sentimental guy, and I drew a little tear drop in the margin of Cross Roads every time I teared up, or had to stop reading because the page was too blurry to continue reading. There are fifteen tear drops in the margins. Understandably, they were in sections of the story that intersected with my personal life, namely with my mentally handicapped sister and with my brother. If I had an ex-wife whom I treated worse than crap and was alienated from my children as only a 24-karat @$$ can alienate, I would have drawn tear drops elsewhere in the book. Young’s first book, The Shack, was denounced by many fundamentalists as heretical. Ravi Zacharias, from the same denomination as Young and myself, said it was “soft heresy,” while Michael Youssef counted no less than thirteen heresies in the best-seller. I’m certain these good people will find similar heresies in Cross Roads. If only these educated men understood how historically determined their theology is, and how important it is to touch people’s hearts with the message of love, healing, and hope. My one disappointment with Cross Roads is not so much with the book as with a pervasive blind spot of the evangelical culture that gave it birth. The word “justice” appears only once in the book (p. 115), is described as a concept that can only fail, and is dismissed along with “rights,” a selfish negative thing. This was the only point where Young’s deliberate use of evangelical clichés, which I usually found acceptable, was unacceptable. As a straight white male, insisting on my “rights” is inappropriate and unnecessary, but insisting on justice for others is to me non-negotiable. When we talk of justice, we do not insist on justice for ourselves, but for others. With Cross Roads, I think Wm. Paul Young could one day be signing a film contract. If I had the money, I’d be locking in rights to the screenplay. The message is significant and contemporary; the material is varied and dramatic; the characters are ethnically diverse and in vogue; and the settings are realistic and surreal. There is more than enough to give directors all the creative jumping-off points they could ever want. This entry was posted in Book Reviews and tagged Cross Roads, The Shack, Wm. Paul Young. Bookmark the permalink. Can someone please explain the places he lives like the difference between his central work place, his condo and west hill home it’s all described in the first chapter I just got super lost but I really want to read this book. Please help me! Thanks I have read Eve and loved it. A bit strange. I will try cross roads and maybe the others?